Kat's Blog: Only One More Day! Only one more day to go until season 3 of True Blood starts. I love this show. I'm a huge fan of the books this show is based on. Charlaine Harris really created something special when she made the Sookie Stackhouse novels. The series does follow the books somewhat. Like book 1 was season 1 and book 2 was season 2. Book 3 will be season 3. But there are differences. The books are all told from Sookie's point of view so in order to bring the other characters in they had to create storylines. I think it's worked well. And season 3 is gonna be awesome. 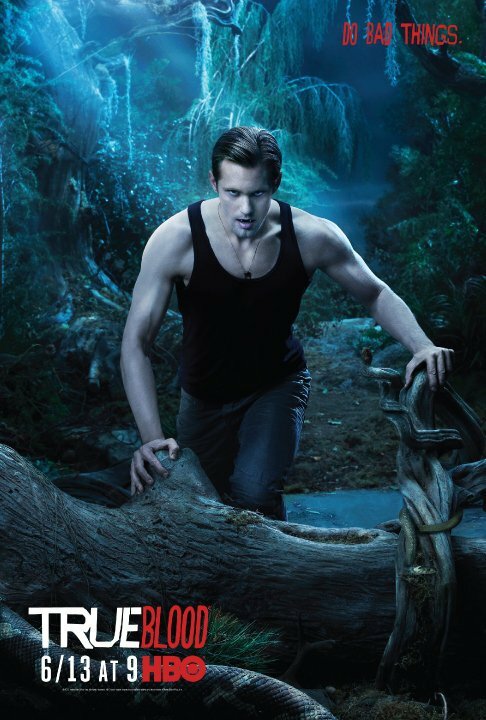 I love Alexander Skarsgard who plays Eric. Eric is my favorite character. And Alan Ball, the director of True Blood has promised that in episode 1 tomorrow we will get to see Eric completely naked. Hooray! My mom is already aware that unless she wants to die she is not to bug me between 9 and 10 tomorrow night. I won't answer the phone or anything else during that hour. That is me and Eric time. :-) Just one more day, less than 24 hours to go until True Blood starts. Yippee!!! Okay, I admit he's tongue lagging, all the way to the floor, lapping against my toes gorgeous...there, you got me to admit that I have no more control over my peepers than you...and blow my refined older woman air...I was trying so hard to appear above purile hero hunger...God, I'm as bad as those women who sit in front of the guys...what are they called...oh yeah Chip "n" Dales and stuff money down their jock straps...the only Chip 'N' Dale I ever wanted to admit I had knoweldge of were the damned cartoon chimpunks, but NOOOOO you had to shame me into admitting I am as capable of seeing why you think Alexander Skarsgard deserves a whole lot of wild and heated panting. I HOPE you're satisfied! Now I have to figure out how to delete all of our comments so we can back to pretending we are staid, mature adults here.